Truck mixer. 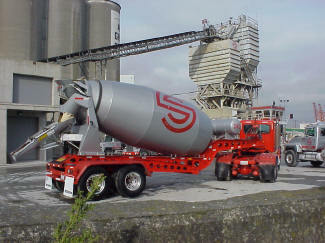 Truck mixers, use a truck-mounted rotating drum that is capable of mixing (if necessary) and agitating the ready mixed PCC. Non-agitating truck. Non-agitating trucks are not able to mix or agitate their payload and usually consist of end dump, bottom dump or side-dump trucks. 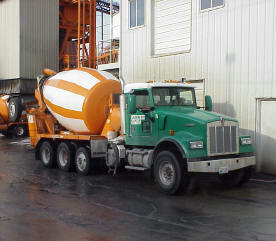 Truck mixers are the most common mode of PCC transport. They consist of a truck-mounted drum that rotates on an inclined axis. A typical mixing truck (see Figures 1 and 2) uses a 6.9 – 9.2 m3 (9 – 12 yd3) mixing drum, the size being limited due to gross vehicle weight of the loaded truck. When used to transport truck mixed PCC, drums can be filled to a maximum of 63 percent of their total volume. When used to transport central mixed PCC, drums can be filled to a maximum of 80 percent of their total volume (AASHTO, 2000). Generally, ready mixed concrete producers, load their trucks with a quantity at or near the rated mixer capacity (NRMCA, 2002). Mixing drums contain helical blades on their inside walls that are designed to push PCC to the bottom of the drum when rotated in the “mixing” direction and out to the discharge point when rotated in the opposite, or “discharge” direction. Most truck mixers discharge to the rear, however, front discharging truck mixers are gaining in popularity because the driver can drive directly onto a site and mechanically control the positioning of the discharge chute without the help of contractor personnel (NRMCA, 2002). Discharge is typically via a 3 – 6 m (10 – 20 ft.) chute. Truck mixers use revolution counters to keep track of total drum revolutions and may also be equipped with slump meters (usually accurate to about 12.5 mm (0.5 inches)) and digital water meters to monitor water usage (ACPA, 1995). Drum rotation (see Video 1) is used for two purposes: mixing and agitation. High speed rotation (on the order of 12 – 15 rpm) is used to mix PCC ingredients into a homogenous material. This type of mixing typically takes between 50 and 100 revolutions depending upon PCC characteristics and environmental factors. After this period of mixing, the PCC is usually required to meet at least 5 of the 6 homogeneity specifications listed in Table 1. Samples for these specifications should be taken from widely separated portions but should also come from the middle 15 – 85 percent of the load so as not to be influenced by beginning and end of load abnormalities. Mixing at the batching facility. The drum is turned at high speed (12 – 15 rpm) for about 50 revolutions while at the production facility, which allows for a quick check of batch characteristics. The PCC is then agitated (< 2 rpm) while in transit to the paving site. Mixing in transit. The drum is turned at medium speed (about 8 rpm) for 70 revolutions while driving to the job site. The PCC is agitated (< 2 rpm) until discharge. Mixing at the paving site. The PCC is agitated (< 2 rpm) while in transit to the paving site. Upon arrival, the PCC is mixed (12 – 15 rpm) for 70 to 100 revolutions, or about five minutes. A minimum time (often 1 to 2 hours) between the time at which when the mixing water was introduced to the portland cement and aggregates and discharge at the site. A maximum number of revolutions (typically around 300) between the time at which when the mixing water was introduced to the portland cement and aggregates and discharge at the site.